Boberg XR9-S is gone. Long live Bond Bullpup. Coated locking block and barrel make grease unnecessary. Wooden grips are nicer than the old plastic ones. Looks like a win to me. Fully supported barrel that’s long for the slide, great accuracy, smooth trigger and very mild recoil, thanks to the rotary breech. And 7+1 capacity in a 6+1 grip size. It does require properly crimped ammunition. Fortunately, pretty much all defensive ammo and about half of the practice ball are crimped. Think of that as buying high octane gas for a race car. This entry was posted in pistol, weapon and tagged 9x19, bullpup, rotary. Bookmark the permalink. 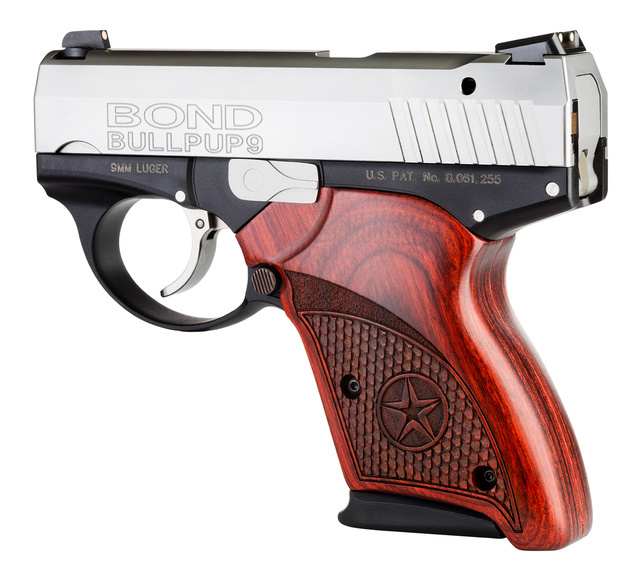 10 Responses to Boberg XR9-S is gone. Long live Bond Bullpup. I wonder if they’re gonna build a longer barreled version. 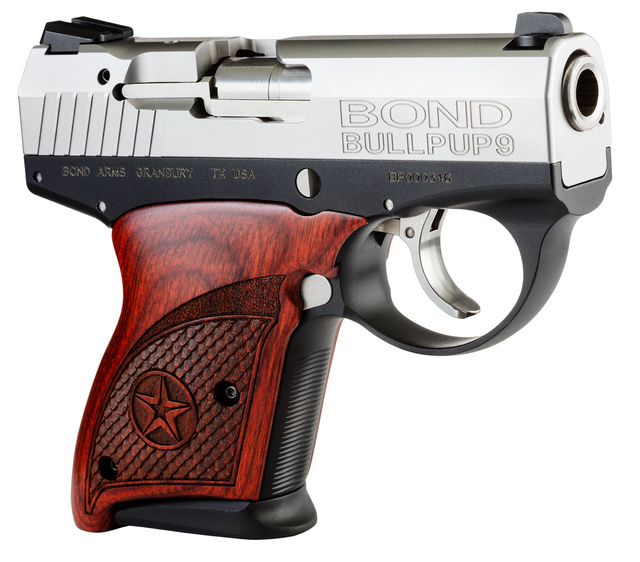 I’d love a 5″ .45.
a longer barrel doesn’t sound too difficult to do, but i’ve heard rumors (that i can’t substantiate, so do reach for your salt shaker now) that trying to upchamber it to .45 was what made Arne Boberg sell the design to Bond. apparently that’s not as easy a job as it sounds. Boberg did in 9mm. XR9-L had a 4.2 inch barrel in the same footprint as the Taurus PT111 G2 with only a 3.2 inch barrel. Upsizing to 45 was indeed problematic. I don’t think I ever spoke with anyone, except Arne Boberg, that was really in love with their Boberg 45. I handled a .45 version in 2015 at the NRA meeting in Nashville. The length of pull was too long for average size hands. My hands are not all that big, but the XR45 works fine for me. In both models I have a bit of trouble reaching the magazine release, and also as delivered by Boberg the magazines don’t really want to drop free. But firing it wasn’t an issue. The problem with the XR45 is that the original design was intended to work (as far as the magazine goes, at least) with somewhat longer cartridges. That requires positioning the cartridge by its rim, rather than by the case mouth as is done in the XR9. So there is a “magazine clip” 🙂 which engages the case rim to hold the case in the right spot. Unfortunately, there is a cutout at the top of the magazine to allow the top round to be pulled out to be fed. So the clip doesn’t reach to the top round, which allows it to slide forward and fail to engage the feed tongs. Result: fairly frequent failure to load, either round not picked up, or round launched out of the eject port along with the empty. Some have cured this by gluing a shim of wood into the front of the magazine. I’m working on a fix which makes the magazine like the XR9: with a ridge that engages the front of the case and prevents it from going forward. I understand from conversations with a Bond person that they were working on the XR45 magazine issue since they had identified this particular bit of design as the problem. So I hope that they will indeed do that (perhaps arriving at the same conclusion I did) and create a Bond XR45. It’s a really nice gun, but it needs reliability. Can I pay extra to have them NOT put that hideous rollmark on the slide? Having shot it, it’s super cool. The accuracy wasn’t great, but that’s because the trigger pull was long and mediocre, the trigger reset was super long, and the recoil was far from mild. It was super snappy. It made a Glock 43 feel pleasant. The action works extremely fast so you get this super snappy whippy harsh recoil pattern. There is a call to ban “slamfire stocks”. If you think about it you can bump fire any SA long arm as long as you thumb is not wrapped around the grip to stop recoil so the easiest type of AR15 to do it with are the California Compliant ones with out a pistol grip. A bit off topic but I’ve just looked on Amazon and there are book (kindle) about Stephen Paddock for sale. Some sick people will do anything for money One came (Who is Stephen Paddock? About Las Vegas Shooter and Mandalay Bay Shooting) out on October 2, 2017, the shooting was the night of October 1, 2017. This book must have written before the name was given out.One more came out on October 5 2017 (Stephen Paddock: A Psychopath’s Motive). All I did was look for books with the words “Stephen Paddock las Vegas”.